Most of the librarians I know specialize in one aspect of library that they are especially good at. In my district, we have librarians who are especially awesome at research skills, social networking, grant writing, advocating for libraries, library organization and tips to make our lives easier, decorating and displays, storytimes, teacher collaboration, etc. For me, that "thing" that I do best is booktalking. Here are some tips for making the most of your booktalks. These tips will work with students at any grade level. Create a PowerPoint to use during your booktalks. Include a cover image and the title, author, genre, and call number. I also like to include why I liked it or who I recommend it for. I included a sample PowerPoint below. I do not show the entire PowerPoint to every class--just 4-5 per group. This way, I have plenty of slides to choose from, the books are more likely to be available, and I don't get bored booktalking the same books. Between classes I frequently add new books or change the order of the slides. Booktalk titles that are actually IN and available for checkout. Making students wait weeks for their book to come in defeats the purpose of the hook. By the time their hold comes in, some will have forgotten why they wanted the book so bad in the first place. It helps to book talk authors or themes rather than individual titles. One booktalk for, say, Lois Duncan counts for ten books in my library. If a particular title is very popular, order more copies (in paperback if you can). You are obviously good at talking up that title, and you can do it again as copies become available again. Use popular music or movies as booktalking themes. Play a song (project lyrics on screen) or show a movie clip to introduce the theme. Talk about the song or have students guess the theme for today's booktalk. The music will help your students remember the booktalk, and it will help them practice/remember the literary term "theme" (an essential skill that appears on most state middle school ELA curriculum guides). Below I included an example of Taylor Swift's "Mean" with lyrics on YouTube. YouTube has tons of videos like this; just search for the song title and you just might get lucky. If not, you could make your own using Windows Movie Maker or even just the lyrics typed out into a few PowerPoint slides. I am using this video in an upcoming booktalk on bullying, featuring fiction and nonfiction books with a bullying theme. I am planning a series on my blog of booktalking themes set to music. The series will include the song, lyrics, PowerPoints, and possible books to discuss. Stay tuned! Pull the books you booktalk onto one table or display to make them easy to find. The reluctant readers you most need to reach are not likely to go digging for their book. The important thing is that they HAVE a book and WANT to read it. Taking the initiative to find the book can come later, after they have become hooked readers. If there is one book that everyone wants, I grab the book and do a "pick a number" game to determine who gets it today. I want it to be fair, not just who is the loudest, pushiest, or fastest to grab the book from the display. Mix quality book trailers, quotations from the book, illustrations, and passages read aloud to add variety. For example, for my booktalk on bullying, I plan to discuss 50 Cent's book Playground. 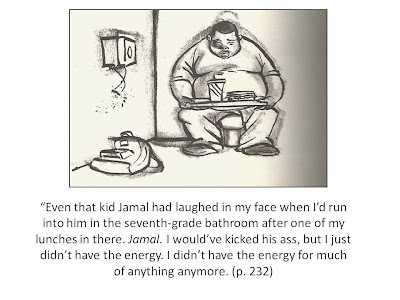 One of the illustrations in the book shows the protagonist, Butterball, eating lunch in the bathroom stall at school. 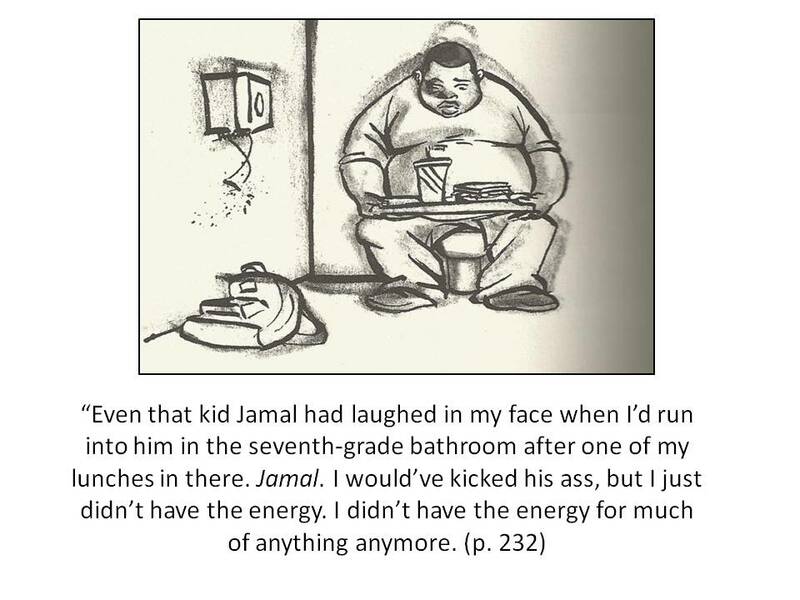 Butterball's sadness really comes through in the illustration, and I love showing the picture when I talk about this book. We have seven copies of Playground at my school, and they all stay checked out constantly. You don't have to have read every book you booktalk. Read the blurb. Show the trailer. Talk about why you want to read it. You do need to know something about the book so you have something to say. Booktalking books you WANT to read models making a "to read" list. Speaking of "TO READ" lists, give students a book log to keep in the front of their binders. One of my favorite English teachers recently left education to stay home with her three girls. This was an activity she required her students to bring with her to the library. When they found a book they were interested in (whether they found it on their own, by friend recommendation, or from my booktalks), they wrote down the title, author, call number, and a short summary of why they wanted to read it. FREE PRINTABLE of "Want to Read" list available here. I left my favorite tip for last! I strongly believe that the best way to get good at something is to observe others who do it well. Find a librarian or teacher in your district who is very good at getting students excited about reading. Attend booktalks at library conferences on the regional, state, and national levels. I've attended great booktalks from Patti Tjomsland, Debby Hipes, Naomi Bates, Peggy Sharp, Teri Lesesne, and Suzy Red. I have learned TREMENDOUSLY from these amazing ladies and others whose passion for books and reading has inspired me to spread the word myself. Observe what you like (and dislike) about the way others present, how long they spend on each title, how they tie it into school libraries and lessons, presentation organization, how they keep it interesting, and audience involvement. By combining what you like best about other booktalkers and adding your own flair to the mix, your booktalks are sure to sizzle! What did I miss? If you have great booktalking tips, please comment! Love your blog! You should post a video of one of your booktalks. Yes, video yourself book talking. I'd love to see your enthusiasm that I imagine through your blog. Yes, would love to watch a video clip of you book talking!